Preheat the oven to 350 degrees; lightly oil Pyrex or tempered glass baking dish. Toss apple slices with sweetener and cinnamon. 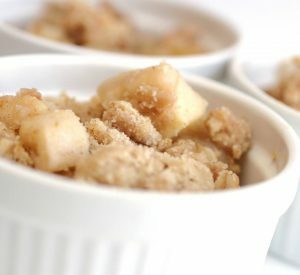 Spread apple slices in prepared baking dish. In a large mixing bowl, combine dry ingredients — oats, flour, chopped pecans, cinnamon, and sea salt – then mix in wet ingredients — brown rice syrup, agave, and oil. Spread over apple slices (you might need to dampen your fingers to do so.) Bake for 40-45 minutes or until apples are tender and topping is golden.